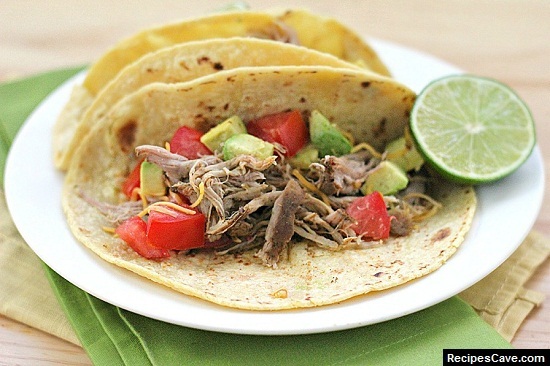 Pork Tacos Recipe Mexican Style - let me show how to cook the Pork Tacos in Mexican Style, Here is what you'll need for pork tacos recipe. Slice the pork shoulder into about 1-cm slices, then transfer to a large dish or bowl. 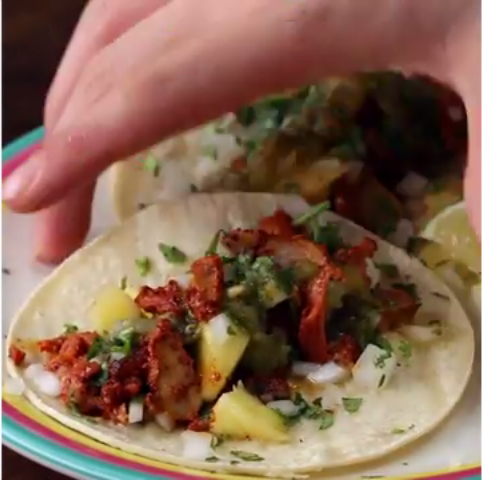 In a bowl, combine the achiote powder, chili powder, garlic powder, oregano, cumin, salt, pepper, vinegar, and pineapple juice, mashing and stirring until smooth with no lumps. Pour the marinade over the pork, then toss the pork slices to make sure that they are all coated on all sides. Wrap the dish/bowl in cling film then marinate the pork for at least 2 hours, up to 3-5 days in the refrigerator. On a baking sheet lined with parchment paper or foil, place down a slice or two of the pineapple. Take a wooden skewer and push it directly in the middle of the pineapple. Remove the pork from the fridge and push the slices through the skewer, layering one after the other until there is a 1-inch gap at the top. Push another pineapple slice on top. Bake for about an hour and a half, until slightly charred on the outside and deep red. Rest the meat for about 10 minutes, then carve off thin slices of the pork. Slice off thin pieces of the roasted pineapples as well. 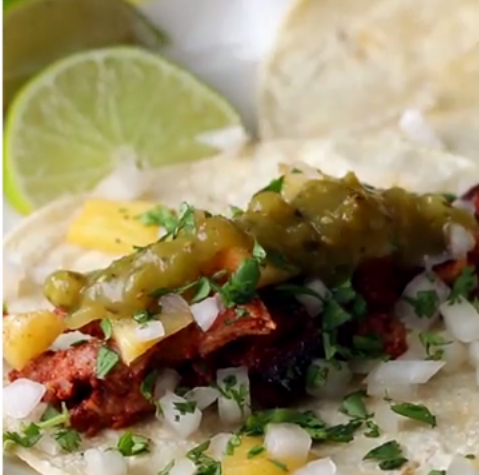 To assemble and serve, place some pork on the tortillas, followed by a few pieces of pineapple, a sprinkle of onions, a pinch of cilantro, then a small spoonful of the salsa.